NOTE: This story was taken from the blog of Bob Speelman, president of Atlas Healthcare Solutions, who works as a nursing assistant each week to better learn his company's motto - Supporting Superior Care. I spent last night at Country View of Sunbury, our 116-bed facility in Sunbury, OH. I met a lot of amazing employees that care for our residents at this facility, including three, oh which I worked with closely throughout the shift. 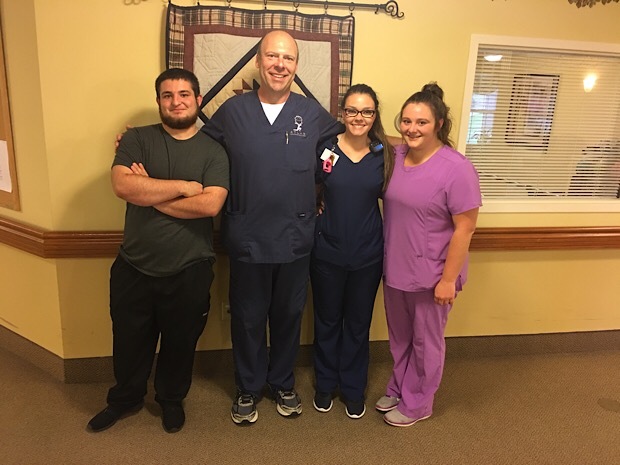 Drew Crook, Shelby Devault and Kaley Webb are three incredible nursing assistants! Drew started out at Country View in the dietary department, and then went on and to earn his STNA license. His passion for his residents and giving care was clear in just a few minutes of working with him. After working with Drew for a few hours, I switched it up and had the opportunity of working with Shelby and Kaley. Their work together, as a team, was flawless. Each would tell the other who they were going to care for, and with whom they needed assistance. It was like watching a quarterback call an audible in a football game. They were amazing together and they both had an incredible gift of caring for their residents and each other. Partway through the night it struck me - Drew is 20 years old, Shelby is 24, and Kaley is 25. Many of the great nursing assistants I’ve had the opportunity to work with have been STNAs a long time and were seasoned care givers. Often you hear that millennials just don’t have the work ethic that the older generation has, but I could not have been more encouraged by what I saw in these three young STNAs last night. It truly was a great thing for me to see and experience. We need more people like Drew, Shelby, and Kaley. I want an entire company filled with them. If you’re a young person out there reading this blog and you really want to make a difference in the lives of others, we’d love to have you on our team! If you’re not an STNA but would like to become one, send us an email, reach out on our website, or stop by one of our facilities and fill out an application. If you are a good match, we can send your to STNA classes and get you on the Atlas team. Thank you Drew, Shelby and Kaley. I am inspired by you, and I have a renewed sense of optimism for the next generation of caregivers! !